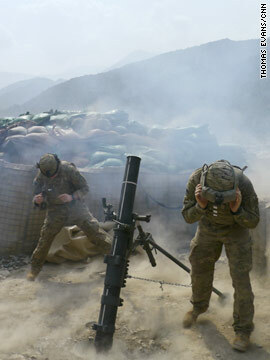 One big question haunts Marine's suicide: Why? Clay Hunt served in both Afghanistan and Iraq, where he was wounded, shot through the left wrist on patrol near the wasp nest of battles, Falluja. Two weeks ago Hunt killed himself in his Sugar Land, Texas, apartment. Marine Corps brothers, Texas friends and family, and schoolmates believe Hunt's suicide is a wake-up call for America. All ask why? CNN's Paul Vercammen explores the story of Clay Hunt, who is described by one mourner as "an American badass with a heart of gold." 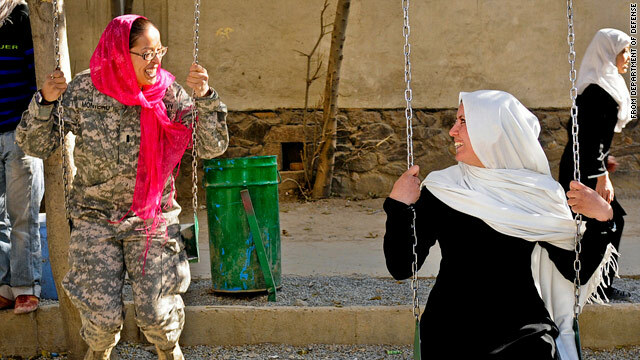 1st Lt. Ana Monteiro swings with an Afghan girl at Ariana School in Kabul, Afghanistan. The top American military officer defended the Department of Defense policy of encouraging female troops to wear headscarves while on duty in Afghanistan, despite criticism the practice makes "second-class warriors." "Those female service members ... do so as a personal choice," Adm. Mike Mullen wrote to Rep. James Langevin, D-Rhode Island, last week. "They feel this gesture helps them in accomplishing their mission by serving as a sign of courtesy and respect toward the locals." For years, some American military women have worn headscarves, similar to traditional Afghan hijabs, when interacting with local civilians.